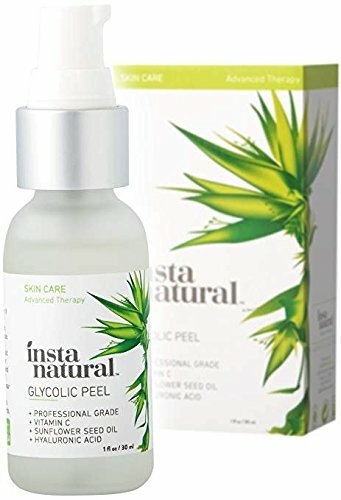 ADVANCED RESURFACING TREATMENT - InstaNatural's Glycolic Acid Peel is professionally designed to exfoliate layers of lingering dead skin cells from the face to bring younger, fresher skin to the surface. REDUCES OIL & BREAKOUTS - This Glycolic Acid Peel works through the layers of the skin helping to remove dirt and stop breakouts. With 30% Glycolic Acid, this peel gets deeper than your regular cleansers, exfoliators or lotions to target dry and dead skin on the surface, helping you to reveal new and revitalized skin. COMPLETE ANTI-AGING FORMULA - This Glycolic Acid Peel works to shed those layers of old cells and rush natural nutrients to the skin, like Vitamin A and C. With the help of Hyaluronic Acid and Sunflower Seed Oil, this advanced formula reduces wrinkles giving your skin that youthful, healthy glow. BRIGHTER & SOFTER COMPLEXION - By clearing away excess dirt and oil on the skin, this at-home chemical peel minimizes the appearance of pores and gets rid of blackheads with ease. If you have any questions about this product by InstaNatural, contact us by completing and submitting the form below. If you are looking for a specif part number, please include it with your message.